The idea was simple enough. Find a big hill and run up and down it until I’d done the equivalent of ascending Everest from sea level and come back down again. 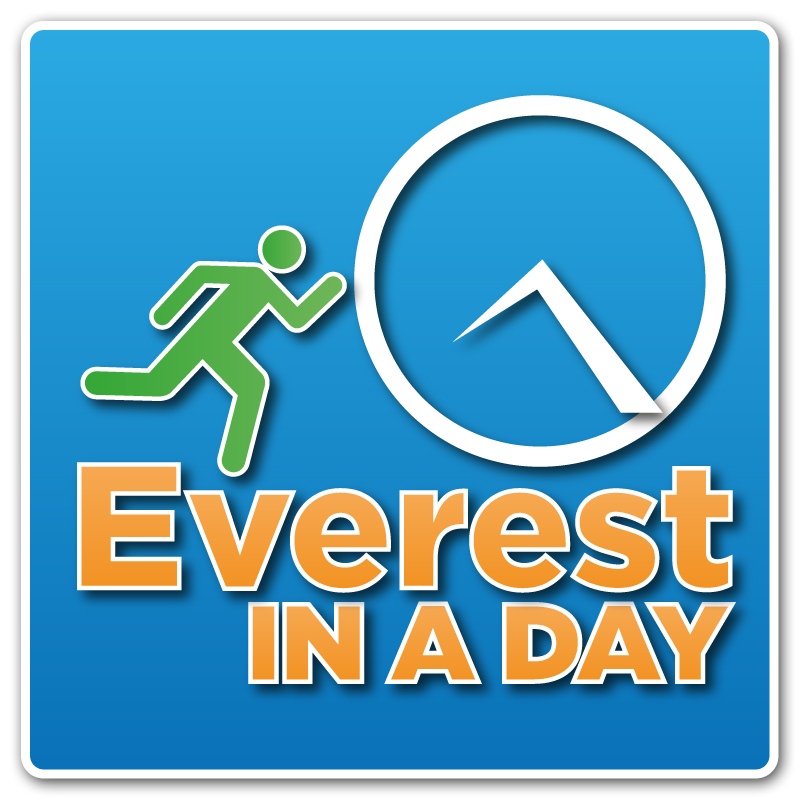 I figured 24 hours was a good target time, hence the idea Everest in a Day was born. The chosen venue was perfect – North Head Historic Reserve in Devonport, Auckland is a volcanic cone that rises steeply to a height of 60m from Cheltenham Beach. The views are stunning and the trails are not too manicured – just the way I like it. Some quick maths told me that I’d need to climb it and descend it a mere 148 times to achieve the goal. That would be 8,880 metres (29,300 feet) of ascent & the same of descent (6.5 Ben Nevis’s or 2.5 Mt.Cook’s). Like so many ideas that look simple on paper (or on a map) the reality was quite different. What follows is an account of probably my toughest ever trail running assignment and a weekend that was very special for so many reasons. Please read & share with anyone who you think can draw some inspiration from this tale. The motivation for this challenge was to train for, and raise awareness of, the epic 1,014-km long CoastPathRun that I am doing in June with Englishman Tom Bland. The two of us have never yet met (except via Skype) but share a common dream of running the entire length of the UK’s longest trail – the South West Coast Path – in record time (just 2 weeks). This in turn is motivated by a joint desire to elevate discussion about Mental Health issues and to raise money for Mind, the UK’s national mental health charity and the Mental Health Foundation NZ. I’d thought carefully about where to start the run. Should it be at the bottom of the hill running up or at the the top of the hill running down? While thinking it through I realized that the whole run was analogous to the battle with depression that so many people face. The daunting up and down run would parallel the roller coaster journey that is a battle with depression, but the message I wanted to convey was clear – keep on battling through the hard times, never give up, come out on top in the end. I had to finish ON TOP – decision made! Talking it up for the camera! And so at midday on Saturday I set off down the hill for the first time. The weather was fine, my wonderful support crew of wife Sally and good friend Casey (veterans of the 7in7 campaigns) had set up a great ‘base camp’ at the top of the hill and Cameraman/Director Dimi Nakov from Zodiac Entertainment was in place to capture all the drama as it unfolded. I’d expected to set off alone. In fact I’d expected to do most of my running alone. But I was joined straight away by fellow trail running junkie Mark Guy, who kept me company for the first 20 or so circuits and went on to complete 74 full loops, in three separate stints, before we were done. And to my amazement (and great joy) Mark was just the first of some 20 or more runners, some close friends but others that I didn’t know so well, who turned out at all times of the day and night to keep me company and offer encouragement. In total I don’t think I did more than 6 loops by myself. To all those people (sorry, you are too many to name individually) I owe a huge debt of gratitude because I’m pretty darned sure I couldn’t have made it alone. The camaraderie that built up over all those hours was awesome and the spirit of your support will give me a warm glow whenever I think about it for years to come. For the first dozen or so loops I tried taking the most direct, steepest and roughest line from bottom to top to bottom, but soon realized that this would not be sustainable and instead sought out slightly easier but longer lines. Each time I hit the top I’d mark off another circuit on the lap count board we’d prepared. Using ‘5-bar gates’ meant that every 5th summit was marked with a horizontal line and it’s quite unbelievable how much joy I got from each one of those. It didn’t take long to figure out what would be the toughest part physically. 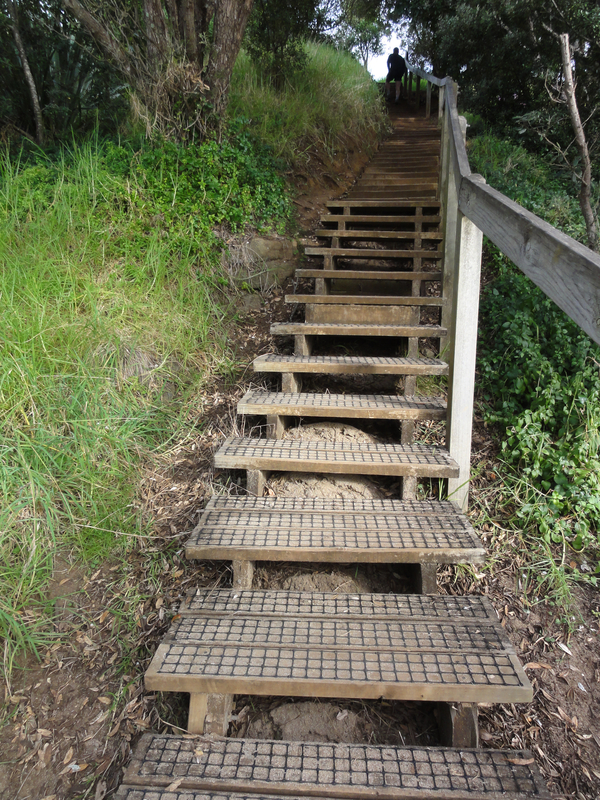 Whenever I hit the beach and had to turn and climb a set of 103 steep steps, that I came to think of as the ‘Stairway to Hell’, my heart sank and my quads trembled with fear. Maybe it was the change from using downhill muscles to uphill muscles or perhaps a lot of it was just in my head, but I loathed these steps more and more as the day, then the night, then the next day wore on. After six hours and some 45 circuits I was feeling good. The first creeping signs of tiredness were there but I was a long way from desperate. I’d kept up a steady intake of water, electrolyte drinks and solid food. But dusk approached and I knew that 12 hours of darkness spent running up and down the same hill would take their toll physically and mentally. However there was a pleasant surprise in store for me. After doing just a few solo circuits in the dark I topped the hill for the 51st time to find a smiling Michael Rodliffe gagging to hit the trail with me. He stuck it out all night long and much of the next day too, racking up a very impressive 75 ascents of his own. I recall long stretches when we hardly spoke but that didn’t matter, just having someone else out there close by was a massive help. By now the biggest psychological challenge was becoming apparent – trying to avoid thinking about how much was left to do. 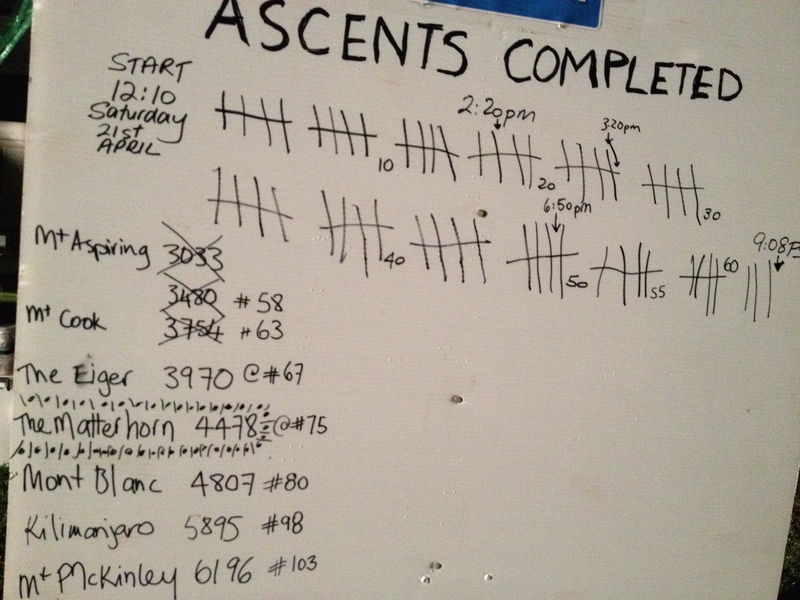 Even though it had come down to 2 digits, the number of ascents left to be made seemed colossal and demoralising. I had to find a way of breaking the end goal down into a series of smaller, more achievable goals (the ‘eat an elephant one bite at a time’ approach). The five-bar gates helped, but they weren’t enough. At some point (I don’t really recall when) I hit on the idea of writing up the heights of other notable peaks and how many ascents I’d need to complete to ‘conquer’ each. I could then start telling myself “just 5 more laps to knock off Mt. 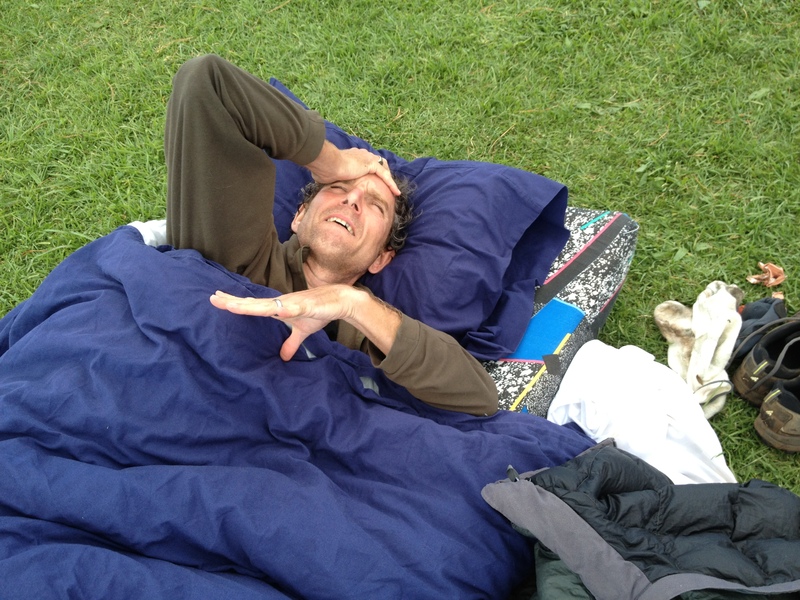 Cook” or “3 more laps to topple Kilimanjaro”. This worked wonders with Sally frantically searching the internet to find new mountains to plug the gaps between peaks that were too far apart in altitude. So it was that The Eiger (3,790m, 67 ascents) fell at about 10pm; midnight was celebrated with the conquering of Mont Blanc (4,807m, 80 ascents) and Kilimanjaro (5,895m, 98 ascents) succumbed at 3.25 a.m. But now the fatigue was mounting and my stomach was rebelling. Water & electrolytes had long since been replaced by sweet black tea and Milo and eating was becoming a very major challenge. At the start of the 100th ascent it became too much and I keeled over to puke up what little was in my guts. For a while I felt better and Denali (6,196m, 103 ascents) tumbled at 4.25 a.m. followed by Aconcagua (6,962m, 116 ascents) shortly after daybreak. But the nausea was returning worse than ever and I was riddled with doubt. What was I thinking when I set this challenge? Why hadn’t I just settled for Kilimanjaro in a Day? When I whispered to Sal “I just don’t know how I can get through this” I think I really meant “I want to give up now”. But the thought of pulling the plug was worse than the thought of continuing. I couldn’t escape the parallel idea that walking off the hill now would be akin to giving up the battle with depression, taking what might appear to be the ‘easy way out’. No way. That couldn’t happen, not given the heavy symbolism that I had loaded this challenge with. I had to go on no matter what. Mates – when I needed them most! 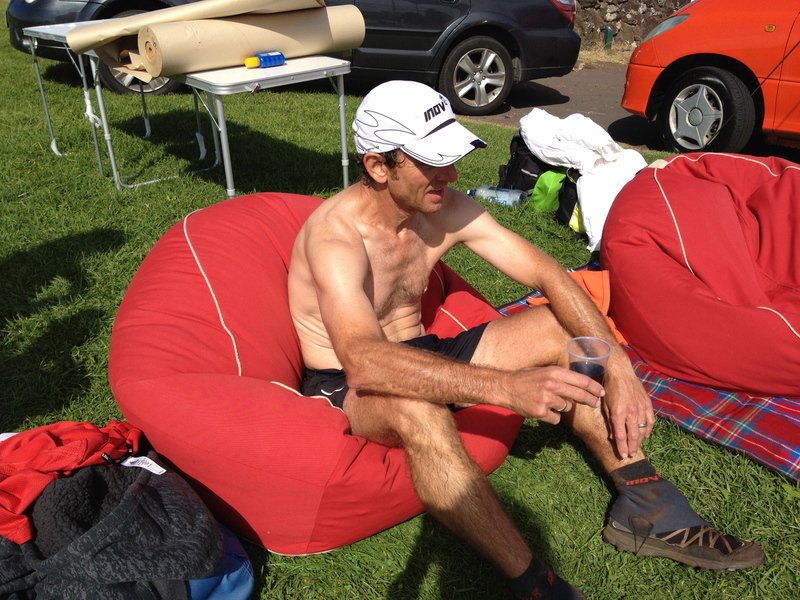 Fortunately I was now being kept company by several close ultra-running friends who knew what I was going through. They kept up a continuos beat of positive energy and lively banter, not caring that I just grunted, scowled, cursed and moaned in reply. Then a short way into descent no. 120 it happened again. I was on my knees retching and gagging as the last of my stomach’s contents exited by the way they had entered. So was this to be the end after all? Perhaps, but before making that heartbreaking call I had to give it a go for a bit longer just in case I came right again. And as so often happens, I did. The nausea cleared and although my nutritional intake was now limited to Coke, ginger beer and electrolyte tablets the sickness had passed. The sickness had passed but not the tiredness. I was pretty much down to a crawl. From 8 circuits an hour at the start it was now more like 5 an hour with a good sit down at the end of each block. But little by little as the sun rose and the day warmed up we chipped away at it… 25 to go, 20 to go, 15 to go…. more people arrived to join in, some of them not even runners…. 10 to go… I might just make it. The only remaining fear now was the heat – it was building fast. Off came my shirt and on each pass over the top of the hill I doused my head with cold water, sipped some Coke, drew energy from all the wonderful people who were cheering me on, and started down the hill again. Now only 5 more ascents of the Stairway to Hell, now 4, now 3…. hey, I think I can do this. Incidental was the fact that I’d already gone past the 24-hour mark. I couldn’t care less because I WAS going to finish this after all. 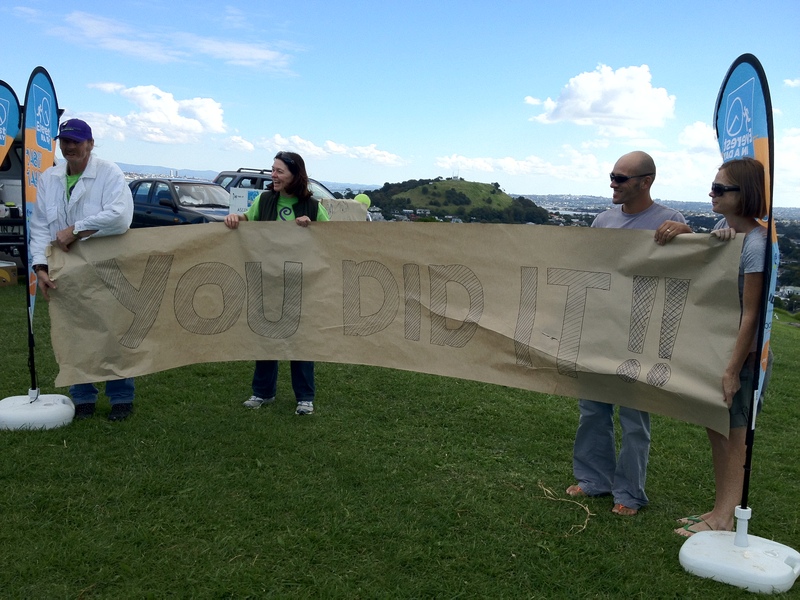 And so shortly before 1pm on Sunday, 24 hrs 44 mins after setting off I topped the hill for the last time, saw the finish banner that the team had secretly been creating, smiled, raised my arms in joy and ran into the warm embrace of my long-suffering wife and cried like a baby. It was over. Never again I swore. Over the last couple of days I’ve had some wonderful feedback from those that followed this little piece of madness. But one pearl of wisdom really hit home… from my good friend Paulo… “they didn’t say it would be easy, they only said it would be worth it”. So true. Be it a self-inflicted battle with a hill or an unchosen battle with depression, it’s not easy. But when you seek out support from loved ones and you grit your teeth hard, anything is possible. We just need to keep on fighting and never give up. For when we look back on the battle, when the pain of the fight has receded, it most definitely IS worth it. 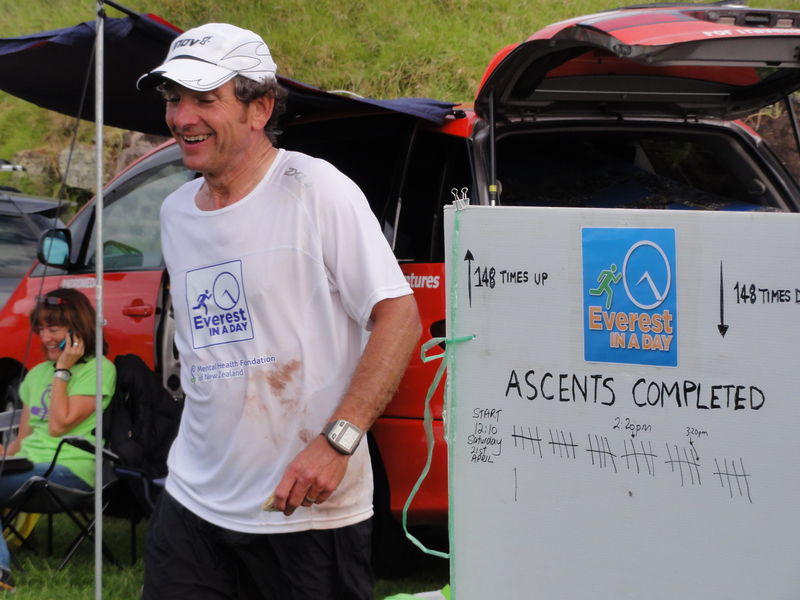 Thanks to CoastPathRun sponsors Spaceships, Inov-8 and Bodyneed for their unflagging support. To all those who ran with me, cheered for me, supported me or messaged me during the day – THANK YOU. 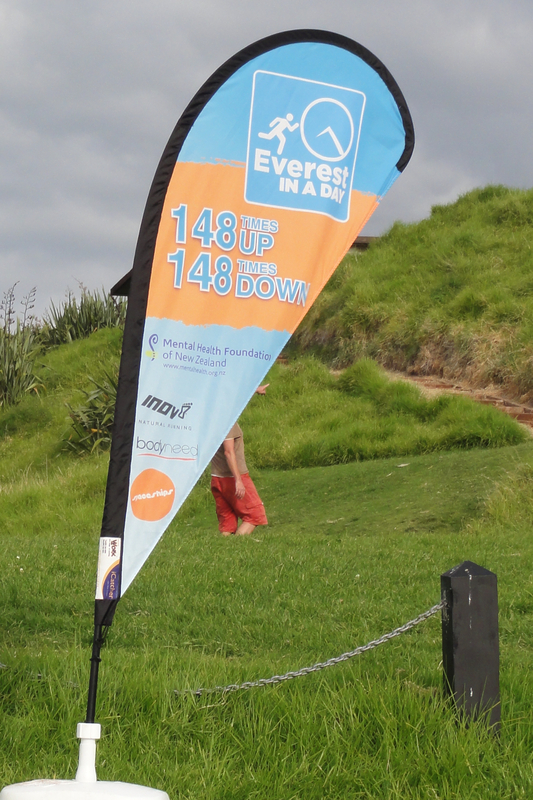 Anyone wishing to make a donation to the Mental Health Foundation NZ in support of CoastPathRun can do so by clicking here – 100% of the money raised goes to the charity. For more rollicking good reads follow CoastPathRun on Facebook. 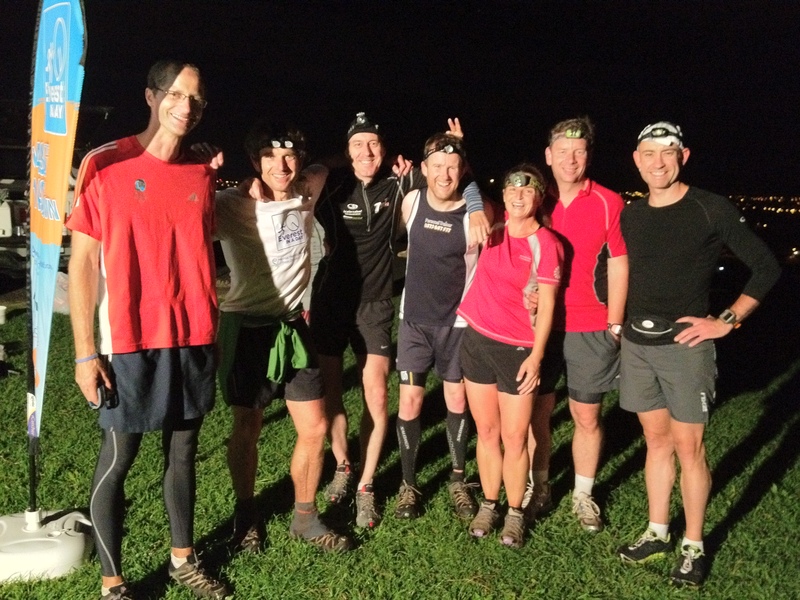 This entry was posted in Coast Path Run and tagged Devonport, mental health, North Head, running, trail running, ultra running. Bookmark the permalink. A normal-sized man with an abnormal-sized heart. CONGRATULATIONS!! – Rest well. No, not Australia but close (well, within 3,000 kms! )… Auckland, New Zealand. Thanks Alistair – maybe I need to find a new hill next year – any suggestions for one in Wellington?